In music, polyphony is a texture consisting of two or more independent melodic voices, as opposed to music with just one voice (monophony) or music with one dominant melodic voice accompanied by chords called homophony. Polyphony is alike a family of voices and the relationships within a family are important for realizing key life and cultural aspirations. The term is usually used in reference to music of the late Middle Ages and Renaissance. Baroque forms such as the fugue—which might be called polyphonic—are usually described instead as contrapuntal. Also, as opposed to the species terminology of counterpoint, polyphony was generally either "pitch-against-pitch" / "point-against-point" or "sustained-pitch" in one part with melismas of varying lengths in another (van der Werf, 1997). In all cases the conception was likely what Margaret Bent (1999) calls "dyadic counterpoint," with each part being written generally against one other part, with all parts modified if needed in the end. This point-against-point conception is opposed to "successive composition," where voices were written in an order with each new voice fitting into the whole so far constructed, which was previously assumed. Two treatises, both dating from c. 900, are usually considered the oldest surviving part-music though they are note-against-note, voices move mostly in parallel octaves, fifths, and fourths, and they were not intended to be performed. The 'Winchester Tropers', from c. 1000, are the oldest surviving example of practical rather than pedagogical polyphony, though intervals, pitch levels, and durations are often not indicated (van der Werf, 1997). Polyphony rose out of melismatic organum, the earliest harmonization of the chant. Twelfth-century composers, such as Léonin and Pérotin developed the organum that was introduced centuries earlier, and also added a third and fourth voice to the now homophonic chant. In the thirteenth century, the chant-based tenor was becoming altered, fragmented, and hidden beneath secular tunes, obscuring the sacred texts as composers continued to play with this new invention called polyphony. The lyrics of love poems might be sung above sacred texts in the form of a trope, or the sacred text might be placed within a familiar secular melody. These musical innovations appeared in a greater context of societal change. After the first millennium, European monks decided to start translating the works of Greek philosophers into the vernacular, following in the footsteps of the Muslims who did that 500 years earlier. People of the Middle Ages knew of Plato, Socrates, and Hippocrates, but were losing touch with what they actually said as the Greek language faded. The ancient works, as well as Muslim commentaries, were translated. Once they were accessible, the philosophies had a great impact on the mind of Western Europe. Faced with new ideas, society was forced to view itself in a different light as secular ideas competed with the doctrine of the Roman church. This sparked a number of innovations in medicine, science, art, and music. The oldest surviving piece of six-part music is the English rota Sumer is icumen in (ca. 1240) (Albright, 2004). Polyphony rose prior to, and during the period of the Western Schism. Avignon, the seat of the antipopes, was a vigorous center of secular music-making, much of which influenced sacred polyphony. It was not merely polyphony that offended the medieval ears, but the notion of secular music merging with the sacred and making its way into the papal court. It gave church music more of a jocular performance quality removing the solemn worship they were accustomed to. The use of and attitude toward polyphony varied widely in the Avignon court from the beginning to the end of its religious importance in the fourteenth century. Harmony was not only considered frivolous, impious, and lascivious, but an obstruction to the audibility of the words. Instruments, as well as certain modes, were actually forbidden in the church because of their association with secular music and pagan rites. Dissonant clashes of notes give a creepy feeling that was labeled as evil, fueling their argument against polyphony as being the devil’s music. After banishing polyphony from the Liturgy in 1322, Pope John XXII spoke in his 1324 Bull Docta Sanctorum Patrum warning against the unbecoming elements of this musical innovation. Clement VI, however, indulged in it. 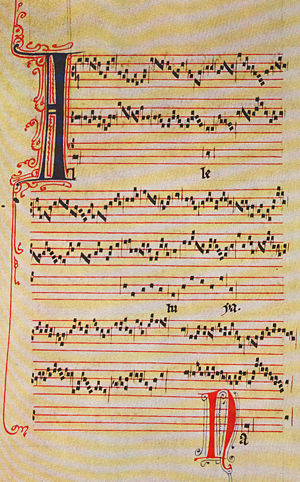 It was in 1364, during the pontificate of Pope Urban V, that composer and priest Guillaume de Machaut composed the first polyphonic setting of the mass called La Messe de Notre Dame. This was the first time that the Church officially sanctioned polyphony in sacred music. Incipient polyphony (previously primitive polyphony) includes antiphony and Call and response (music), drones, and parallel intervals. Iso-polyphony is a form of traditional Albanian polyphonic music. It can be divided into two major stylistic groups as performed by the Ghegs of northern Albania and Tosks and Labs living in the southern part of the country. The term iso is related to the drone, which accompanies the iso-polyphonic singing. The drone is performed in two ways: among the Tosks, it is always continuous and sung on the syllable ‘e’, using staggered breathing; while among the Labs, the drone is sometimes sung as a rhythmic tone, performed to the text of the song. It can be differentiated between two-, three- and four-voice polyphony. The phenomenon of Albanian folk iso-polyphony is proclaimed by UNESCO as a "Masterpiece of the Oral and Intangible heritage of Humanity." This page was last modified on 31 March 2019, at 22:16.